During the elective course “Religion in Contemporary Russia” at the Higher School of Economics in St. Petersburg, undergraduate students discuss the relevance of various classic definitions of religion. Then they are asked to speculate about “minimal religion” in Russian society. The stories about meetings with the sacred which they tell are usually about dead relatives who visited them or members of their kin in a dream shortly after their death. Typically, these dreams are interpreted by the family as an alarming message from the deceased who feels neglected and wants to communicate. As a result, the dreamer goes to church to do her minimal religious work, that is, to light a candle. 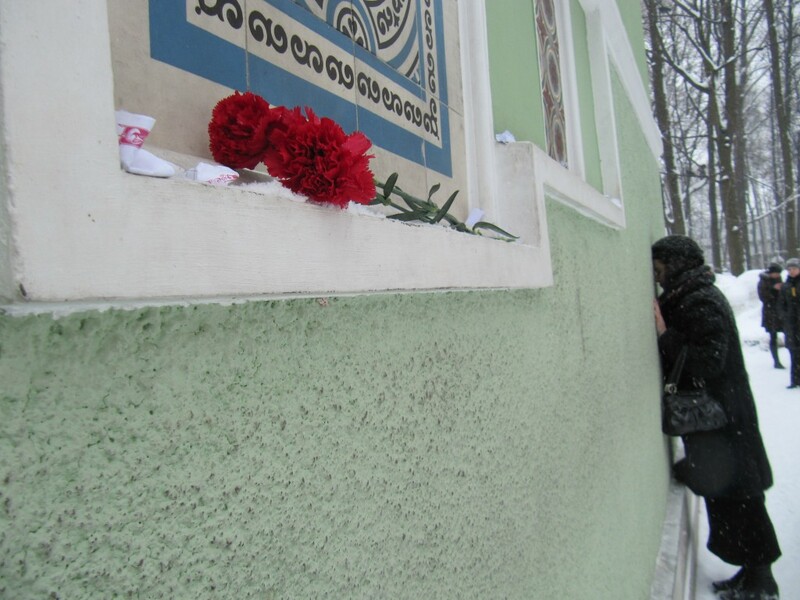 In a minimalistic variant of Orthodox Christianity shared by many Russians, lighting a candle means engaging in prayer. In this silent act, the church candle becomes not just a material instrument of communication between the believer and a sacred world; instead, the candle becomes a metaphor for the believer herself and her unsaid prayer. At the end of the Higher School of Economics’s course the students are invited to a small field trip to a chapel of the popular Saint Xenia the Blessed (or the Holy Fool) of St. Petersburg. Many urban people of different ages and social backgrounds come to ask the saint’s help in their everyday affairs. Only a few of the pilgrims are praying with words, by reading the akathist hymn to the saint, from printed booklets; but everyone is praying with things. The most typical way to send a message to the saint is to write her a letter on a piece of paper, roll it up or fold it to minimize its size and then put this small object into a crack in the chapel wall. Though criticized and even prohibited by the local clergy, this practice flourishes, as it gives to the pilgrims an idea of direct and personal communication with the saint. Underneath the massive cloth architecture of Oral Roberts’ canvas cathedral, the “world’s first healing film” was screened for a crusade audience of over 10,000 on September 29th, 1952. 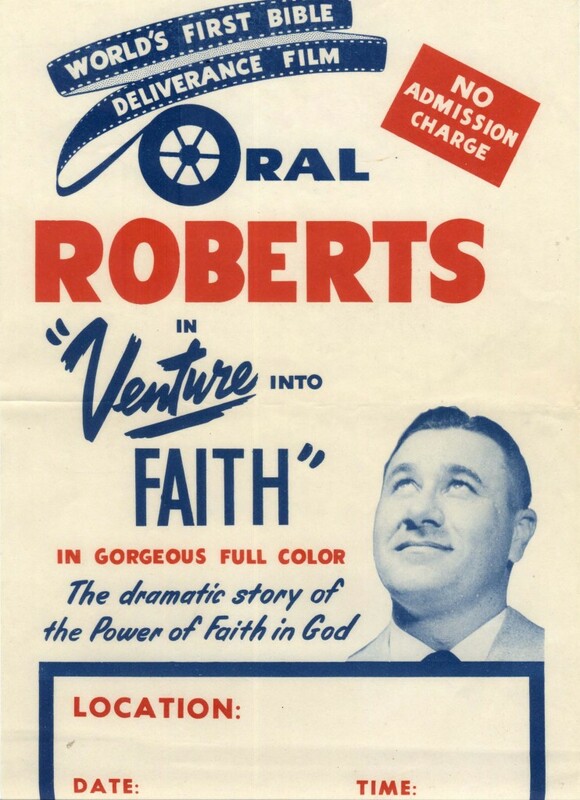 Venture Into Faith is a compilation of actual archival footage shot earlier that year during a healing crusade in Birmingham, Alabama, woven seamlessly into highly produced scenes recorded in a Hollywood studio. The climax of the film, for example, features the miraculous cure of a tubercular boy named David through a performance of prayer. 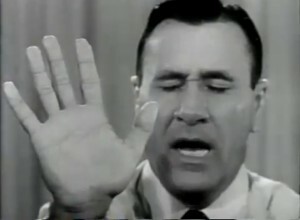 Although the actual performance of this healing prayer was performed by Oral Roberts and a group of professional actors, the final edited version of this spectacle of divine communication oscillates between “live” archival footage shot during a healing campaign and rehearsed “acting” recorded under the careful orchestration of a Hollywood director (1:23:39 in film). A pivotal moment in the technological history of prayer occurred when Oral Roberts introduced the motion picture camera into the charismatic atmosphere of his massive “tent cathedral.” Through the medium of television, millions of Americans experienced performances of Pentecostal healing prayer for the first time. More than this, however, the motion picture film significantly altered the enthusiastic environment of the healing tent while organizing new sensorial and performative possibilities within the practice of prayer itself. From the first telecast in 1955, it is as if the mechanical eye of the camera gradually insinuated itself into the actions of the prayer line, drawing ever-closer to the intimate tactile contact between the patient and the healer. Through the zooming capacities of the cinematic eye, members of the television audience got an intimate view of the performance of healing prayer, including the vigorous gesticulations, bodily contact, and ecstatic countenances enlivened through this curative technique. The new definition of prayer laid forth in this portal could be used to articulate key techniques of Pentecostal and charismatic Christian healing prayer such as the “point of contact.” Now a ubiquitous term in the performance of Pentecostal prayer, Oral Roberts developed this technique specifically in relation to the radio apparatus. As millions of listeners tuned in to the “prayer time” of his Healing Waters Broadcast in the early 1950s, audiences began to experience distanced voice-in-prayer in a radically new way. The machinations of radio loudspeakers translated a praying voice into a series of warm vibrations that were haptically registered as listeners were exhorted to “lay their hands upon the radio” as “the point of contact.” Technical reproduction allowed for a new tactile sensation of the voice through the hand, signaling a profound shift in the experience and practice of prayer. Prayer in the age of mechanical reproduction thus marks an inversion of the rite of manual imposition: it is no longer the healer who lays hands upon the sick, but the patient who reaches out to make tactile contact with the apparatus. The radio as point of contact organized a new “apparatus of belief” that no longer subsisted upon earlier modes of temporal articulation. 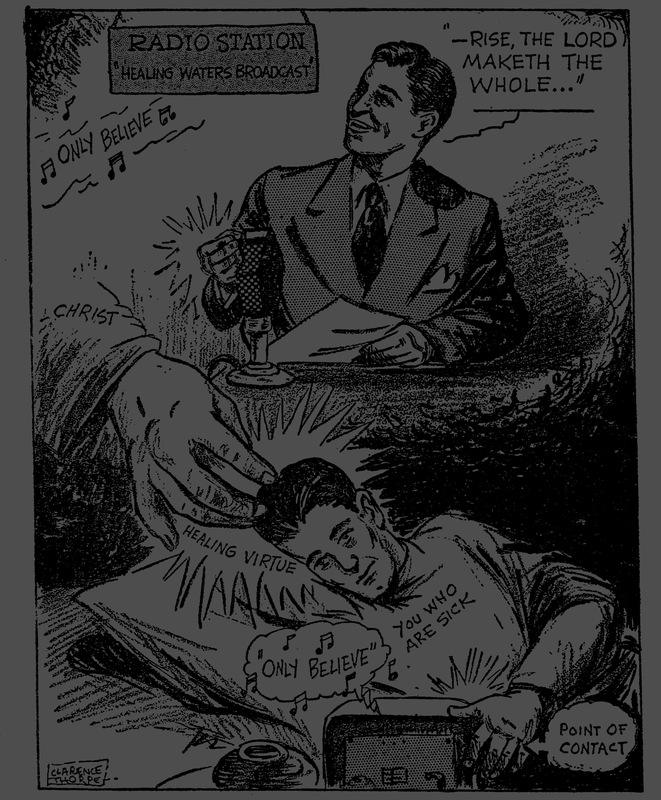 Instead of articulating belief through the temporal deferrals and delays characteristic of the exchange and circulation of objects (see for instance, Prayer Cloths), for example, the radio apparatus produced the sensation of belief through sensory displacements and disjunctures attuned through the medium itself.